In Lumberyard Editor, the console window shows a running list of all editor commands, processes, and output. For example, when you delete an entity, the console shows the action and the output. You can use the console to enter or modify console variables (CVARs). 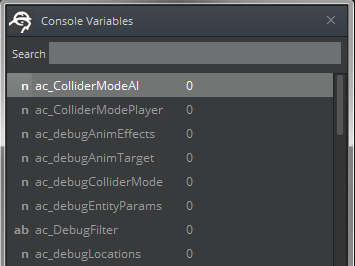 Console variables are a type of variable that you can manipulate in Lumberyard Editor. You can enter commands directly in the console window or search and edit console variables. In Lumberyard Editor, choose Tools, Console. Click the X icon in the left corner to open the Console Variables window. The Console Variables window lists all available console variables. Enter a name to search for a specific console variable. To learn more about the console variable, pause on the name. 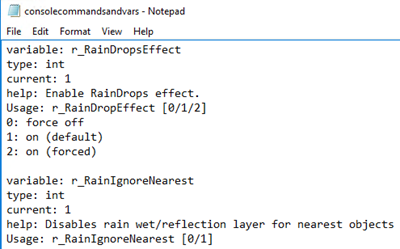 You can retrieve a complete list of console commands and variables, including their descriptions and assigned values. Navigate to the lumberyard_version\dev\ directory and then open the consolecommandandvars.txt file. You can see the available commands and variables in the file. You can specify a sub-string parameter to restrict the results that you want. For example, the DumpCommandsVars i_ command exports all commands and variables that begin with the prefix i_, such as i_giveallitems and i_debug_projectiles. The order of execution is also the override order. For example, console variables set in code override those set in configuration files (and level.cfg overrides user.cfg, and so on). Console variables set in flow graphs override any identical console variables set in code. Finally, console variables typed directly into the console override all the other console variable settings. You can specify values for console variables in the console to apply changes to your level. In the Console Variables window, search for the variable name, double-click the value, and then enter the value that you want. In the Console command line, enter the console variable and its value, and then press Enter. For example, enter the r_DisplayInfo=1 command to display debugging information in the viewport. You can specify values for console variables in the configuration files, such as the level configuration file ( level.cfg). Navigate to the directory that has the configuration file. For example, if you want to configure the level.cfg file, navigate to the lumberyard_version\dev\ProjectName\Levels\level_name directory. Use a text editor to edit the file or to create one. Specify the console variable name and the value. For example: r_DisplayInfo=1 shows debugging information in the viewport.